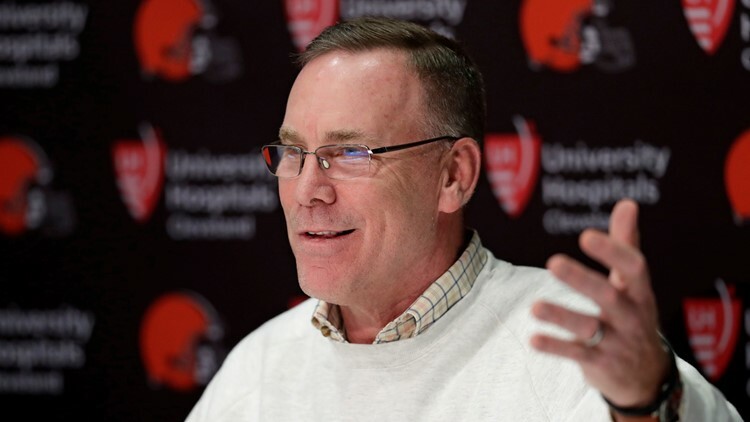 During an appearance on Adam Schefter's podcast, Cleveland Browns general manager John Dorsey revealed his team is considering acquiring a first-round pick in the 2019 NFL Draft. For the first time since 2008, the Cleveland Browns are prepared to enter an NFL Draft without a first-round pick. In acquiring Odell Beckham Jr. from the New York Giants last month, the Browns parted ways with their first-round pick (No. 17 overall), a third-round selection and safety Jabrill Peppers. But in speaking to ESPN's Adam Schefter, Browns general manager John Dorsey hinted that his team may not be prepared to stand pat on draft night -- at least not as far as the first 32 selections are concerned. "Business as usual. That's the way it is," Dorsey told Schefter on his podcast when asked what it will be like not having a first-round selection. "Who's to say I won't go up in the first round?" "Might we see something there?" Schefter pressed. "You never know," Dorsey replied. "My phone's open. They can give me a call." General manager John Dorsey and the Cleveland Browns are drawing rave reviews for their roster moves during the legal tampering period. Following their blockbuster deal with the Giants, the Browns currently lay claim to eight selections in the upcoming draft, the first of which will come in the second round with the 49th overall pick. After that, Cleveland possesses picks in the third and fourth round, three in the fifth round and sixth and seventh-round selections. While Dorsey's comments hardly guarantee the Browns will move back into the first round, it's worth noting his previous aggressiveness in acquiring picks. Of Cleveland's eight remaining selections, three were acquired by way of trades, including deals in which the Browns parted ways with Josh Gordon, Carlos Hyde and Cody Kessler. Previous to arriving in Cleveland, Dorsey made a habit of making moves in the first round during his time as the general manager of the Kansas City Chiefs. In 2016, he traded the Chiefs first-round selection (28th overall) to acquire three picks, a year before trading up from the No. 27th pick to the No. 10 pick in 2017. With that first-round selection -- his last as GM of the Chiefs -- Dorsey selected quarterback Patrick Mahomes. In his first season as a starter, the Texas Tech product completed 66 percent of his passes for 5,097 yards and 50 touchdowns, earning MVP honors for his efforts.